Last Thursday, my husband and I left for our annual spring camping trip to Algonquin Provincial Park. I always pick a route that only involves one portage since it is my husband who has to carry all of our gear and we usually err on the side of caution, bringing far too many supplies. Then again, we will not go without a good air mattress that fits the both of us. We left home around eight o’clock in the morning and arrived in Algonquin at noon, where it was raining cats and dogs. We unpacked the van, loaded up the canoe and went on our way. With a raincoat under my life-jacket, I believed I would be protected from the rain, but that didn’t work out. As we paddled our way on Smoke Lake, the rain came down harder, the wind picked up, we had foot and a half whitecaps, and waves were pushing water into the back of the canoe (I learned about that later). Thanks to the blustery wind, we were able to paddle all 5¼ kilometres of Smoke Lake in an hour and a half. We were now at the portage, the rain had eased off to a fine mist/spray. The portage between Smoke Lake and Ragged Lake is only .25 kilometres but the first 100 metres is rocky and uphill, then downhill for the rest. It is not a well maintained portage. It took my husband six trips to bring all of our gear to the other side. Once all our gear was back in the canoe, we set off in Ragged Lake looking for a site. Luckily we were familiar with it, having been there eight years ago with our children (they were aged 14, 11, and 9 years at that time). We actually had the entire lake to ourselves that night, no one else had booked a site, so we had our pick, even so, it still took us about 45 minutes to decide. 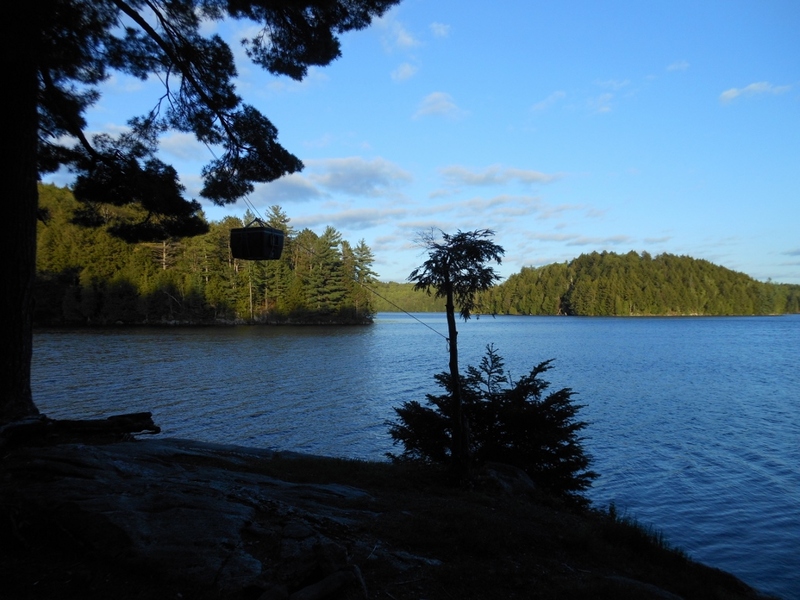 The site we chose was fabulous, a nice sandy beach to park the canoe, two levels, one where there was the fire-pit, and the second for our tent. After unpacking and setting our tent up, I am shivering because I’m sopping wet, which is what happens when you buy a cheap $2.00 rain poncho (if you can afford it and will be paddling in rain, buy the expensive waterproof clothing). 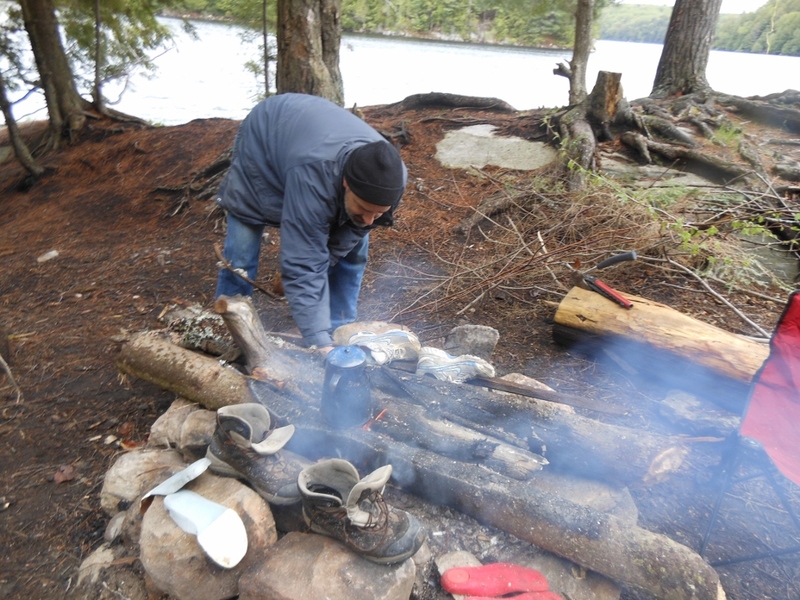 Hubby started a fire so we could warm up, dry my running shoes and his work boots. We changed into warm clothes, I went for 5 layers! One tank top, one t-shirt, one long-sleeved shirt, one kangaroo sweater (hoodie), and hubby’s fleece sweater since my coat was beyond wet. It was now time for supper, so we took the very easy route where you have a pre-dried package of something called Teriyaki Beef, add two cups of boiling water, and let sit for 10 minutes. Not very tasty, but warm and filling. After supper, I actually went to bed at 6 p.m., and hubby joined me at 6:30 p.m. I slept in my 5 layers of shirts & sweaters, jogging pants, homemade very warm knitted socks and my winter hat. Naturally I woke twice during the night having to go pee. The second time we got up to do our business, it was lightly snowing outside! Luckily we are in a 4-season tent, and by the middle of the night, were toasty warm. We both slept until 8 a.m. the next morning. Friday was another blustery day, with the sun finally making an appearance late afternoon. Just before supper, I took a bad tumble. I did a lovely 2 1/2 rotations, while trying desperately to grab the wooden bench, only to fail, and fall down the hill. I twisted my back, lightly sprained my ankle, and scraped my left hand, thankfully though supper made up for my soreness! For dinner, I roasted six cloves of garlic and mushrooms on the fire, then added them to a cream sauce made up of cream, skim milk powder and butter. The cream sauce was then mixed with rotini pasta and lots of shrimp. I will definitely be making this at home. After dinner, while trying to clean my coffee mug, I burnt my hand. Never a dull moment when camping with me! Saturday was lovely. I was able to peel off numerous layers of clothing, and apply sunblock. 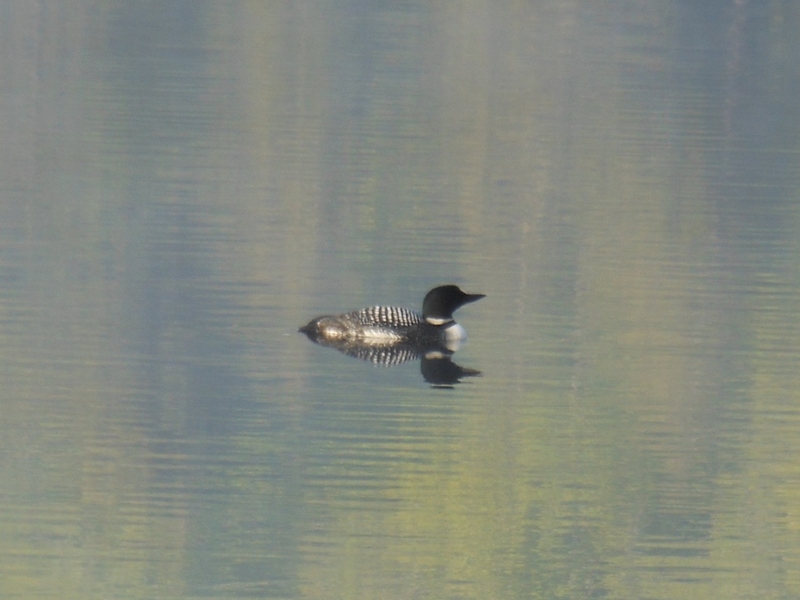 For nature excitement, we saw a loon eat a fish. Later, two canoers from Buffalo stopped by asking for directions, otherwise we didn’t see anyone else on the lake. It was very peaceful. Sunday turned out to be even nicer than Saturday, lots of sun, plus the water was somewhat calm so we went canoeing. We paddled about a kilometre and a half to an island in the West Bay, where we found a group of high school students, and their teachers from Sarnia to be camping. 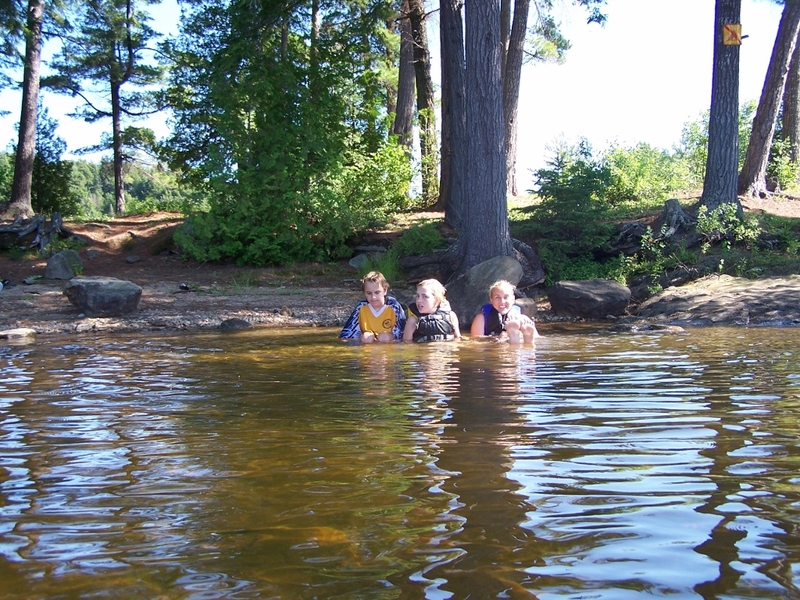 After chatting with the one teacher, we found out that they had started canoeing Thursday night on Canoe Lake (north of highway 60, whereas Ragged is south of the highway) but had to turn back after two of their canoe’s were swamped. After our chat, we started canoeing back to our site, which was now a lot harder, since the wind had reappeared and was against us. Once back on our site, we were visited by four canoers from Pennsylvania, who were also looking for directions to the same bay as the boys from Buffalo. Monday was our last day and we woke to a beautiful sight. The morning fog, the mist coming off the water, then a flotilla of canoes. The group of high-school students were leaving, one canoe after another coming out of the mist. It was breathtaking. 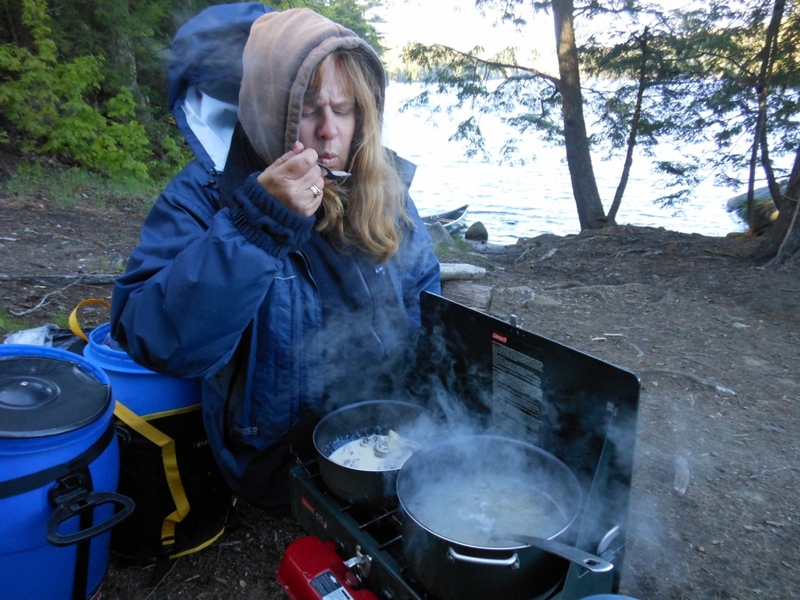 This entry was posted in Algonquin, Algonquin Provincial Park, Camp, Camping, Camping supplies, campsite, Canada, canoe, Canoe Lake, Canoeing, Canoes, Ontario Parks, Ragged Lake and tagged Algonquin, Algonquin Provincial Park, Back Country, Camp, Camping, Camping Supplies, Campsite, Canada, Canoe, Canoing, Ontario, Ontario Provincial Parks, portage, Ragged Lake on May 26, 2014 by AlwaysARedhead.